‘In Russia, Conflating Journalism and ‘Hooliganism’’, posted on the New York Times Lens blog is an article by Steven Lee Myers about photographer Denis Sinyakov, the Moscow-based freelance photographer who was arrested when Russian soldiers illegally seized the Greenpeace ship the Arctic Sunrise on the high seas on September 19. All of those on board, including Sinyakov and were initially charged with piracy. On 26 September a court in Murmansk ordered he be put in preventive detention for two months, according to Reporters Without Borders because ‘he “often travels abroad” and might try to elude the authorities’. The Russian prosecutors have since reduced the charges against him and the other 29 arrested to hooliganism, which still carries a maximum sentence of 7 years, and they could be held in jail for up to 18 months before the case comes to court. Sinyakov was arrested while working as a journalist and his detention constitutes an unacceptable violation of freedom of information,. By investigating this photographer and the Greenpeace activists he was accompanying on such an absurd accusation as piracy, the Russian Investigative Committee is criminalizing both journalists and environmental activism. Sinyakov worked as a photo editor and a staff photographer at Agence France-Presse (2004-2007) and at Reuters (2007- July 2012) when he went freelance to be able to concentrate more on the stories that interested him “on the environment, human rights, politics and the economy.” According to the NY Times post, the Russian news agency Lenta.ru have provided a letter for the court that he was accredited with them. Those who can read Russian can read his ‘Entries from Jail‘ (Записи из СИЗО) on his web site. All of us can support Sinyakov and the rest of the Arctic 30 by sending a letter to our Russian embassy from the Greenpeace site. 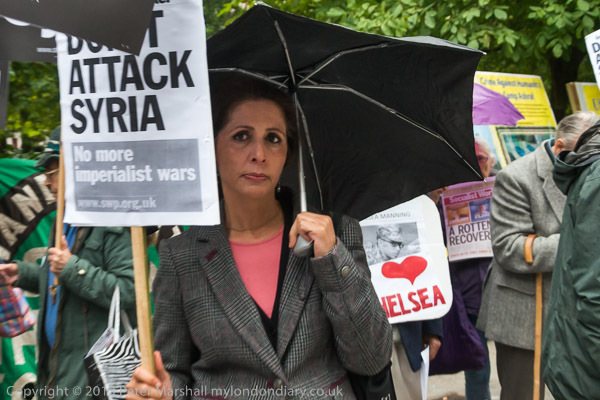 Protests are also being organised outside many of them, including one in London this evening. Kieron Bryan, a British freelance videographer who previously worked at The Times, the Mirror and Current TV, leaving The Times in January to pursue freelance work, is also among the 30 arrested. He was employed by Greenpeace on a short-term contract to document the organisation’s work on Russian oil exploration in the Arctic Circle. The BBC reported today that his family are hoping to fly out shortly to visit him in prison. Fortunately the weather began to clear up soon after I left Lewisham, catching the train back to London Bridge and then the tube to Westminster. 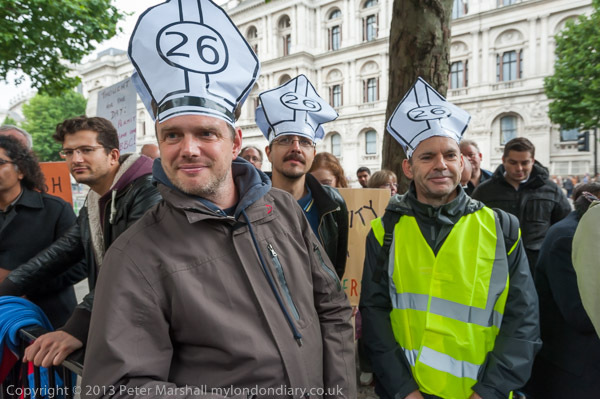 And although I was too late to photograph the 6th annual Secular Europe Campaign march, I was there in time for the rally opposite Downing St.
Visually the most noticeable thing were the paper hats worn by some of those taking part, in the shape of a bishop’s mitre with the number 26 on them. 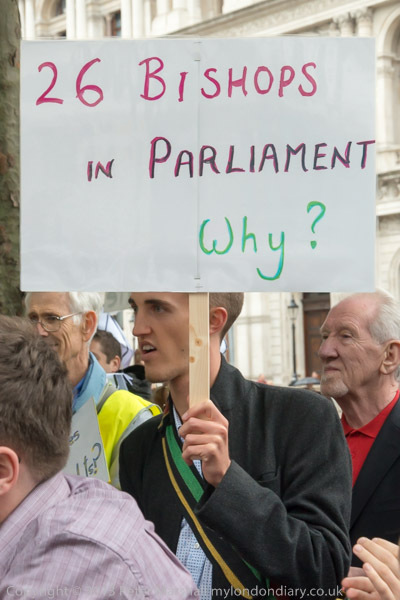 The point was perhaps made more clearly in a placard. Though my favourite poster, as a regular morning listener to the ‘Today’ programme on my radio alarm, was one saying ‘Thought for the day; can we have one?’. Although my alarm is set for much earlier, it’s nearly always ‘Thought for the Day’ which actually drives me out of bed, and I seldom hear all of this three minute interlude in the programme, though there are just a few that make me stop and listen before I rush to the bathroom. 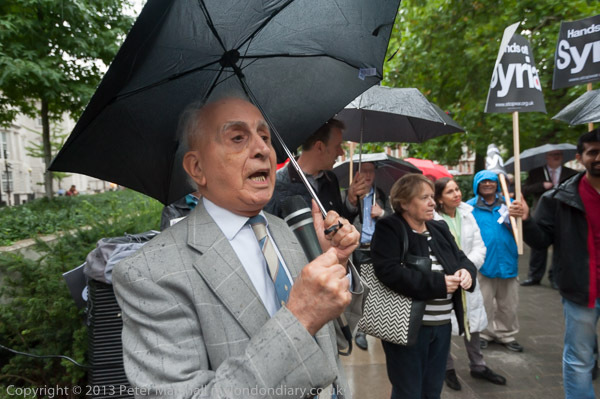 Some of them – or what I hear – strike me as pretty secular in any case, as is most of the rest of the programme, and if what I’m hearing from the speakers as I take some pictures is representative of what their ‘Thoughts for the Day’ might be, I’d be in real danger of going back to sleep. 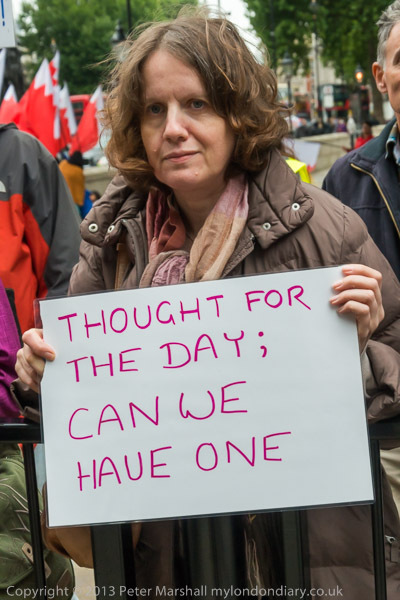 I left the Secular Europe Protest sooner than I needed, as there seemed little chance of good pictures and a certainty of getting rather bored. I’ve no love of the established church, and certainly in favour of secularism so far as our laws are concerned, but can’t get worked up about Bishops in the House of Lords, who generally seem to do at least as good a job as the rest of that unelected body. Tackling class and elitism and the entrenched power of a small minority seem far more important issues and being anti-religious as those I heard seemed to be seems rather a matter of ‘bashing the bishop’. An activity that of course has its place. 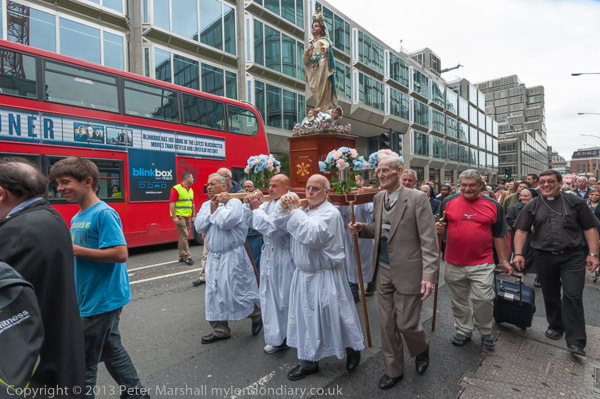 I wandered slowly to my next appointment, arriving early, and having to wait a very long time outside Westminster Cathedral as the web page for the event had misled me about the time that the Maltese would emerge from their celebratory mass for the Malta Day Procession procession to make their way carrying the rather hefty statue of the Bambina to the Sacred Heart Chapel of Ease in Horseferry Road. I’m not a fan of the Catholic Church, though it is a very mixed organisation, parts of which seem not to have move on since the Spanish Inquisition, while others are organising some of the more radical movements in South America. 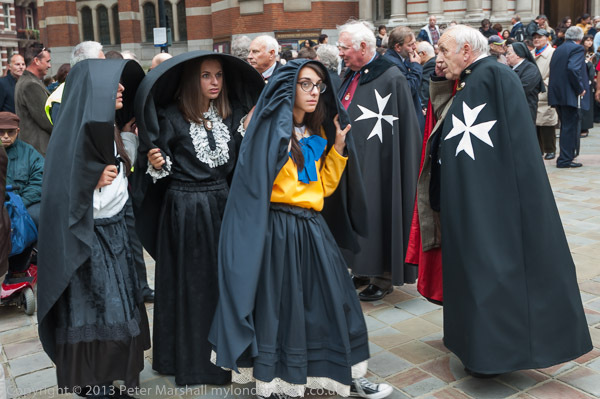 Perhaps too I still bear a personal grudge against the Maltese branch of the church, since my earliest girl friend was Maltese, her uncle a bishop. When he heard she was going out with a non-Catholic she was immediately shipped back from England to Gozo. It was a very long time ago, and I think I’ve got over it! But while I don’t share their religion, visually the event was far more interesting. I particularly liked the view of the statue being carried out of the cathedral door. And in its peculiar way, Westminster Cathedral is a quite splendid building which makes a good background. I had a few technical problems, partly I think because I got a little distracted with someone talking to me. I’m generally not very sociable and need to concentrate on the job when I’m making pictures and being interrupted a lot really does put me off my stride. 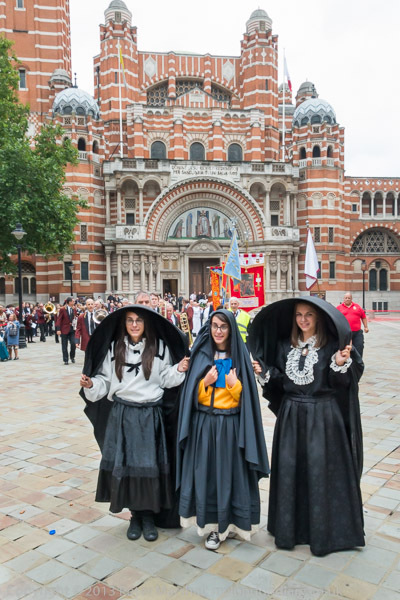 So a few exposures were way out – probably because of all the black cloaks and those strange hoods worn by the girls. Possibly I had the camera on ‘spot’ metering, which is fine and precise so long as you pick the right spot, but can be disastrous if you are not thinking. And for the final few frames I managed to knock the lens hood on the 16-35mm slightly out of position, getting a little total vignetting at top right and bottom left. Small enough to be easily missed in the viewfinder, but annoying, though in this case fairly easily dealt with. But its a shame that Nikon didn’t design a better bayonet fitting for their lens hoods and make them slightly more rigid. Most days when I’m out taking pictures I find myself bending down at some point to retrieve a lens hood that has self-detached. 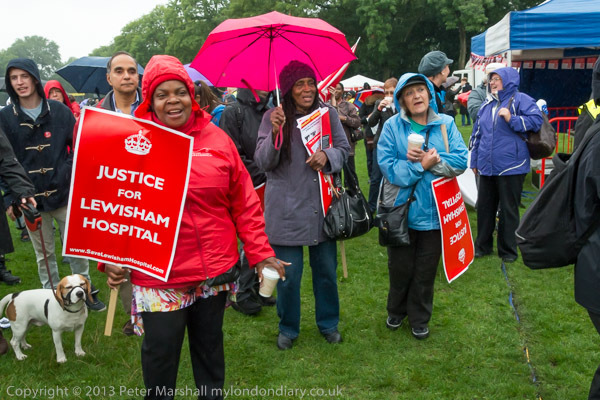 It was a shame that it was such a damp and rather chilly day for the Save Lewisham Hospital Campaign‘s Victory March. Perhaps rather more would have come on a nice day, and it would certainly have been more pleasant both to take part in and to photograph. 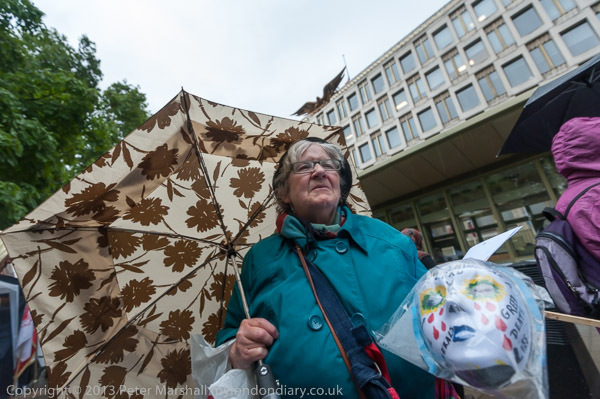 Fortunately the rain slackened off a little, and people could march without umbrellas, but the atmosphere was still a little dampened. Though the umbrellas were up again for the fair at the end of the march, and it wasn’t really the weather to be dancing on the grass in Ladywell Fields. Or even like these people, standing watching others dance. 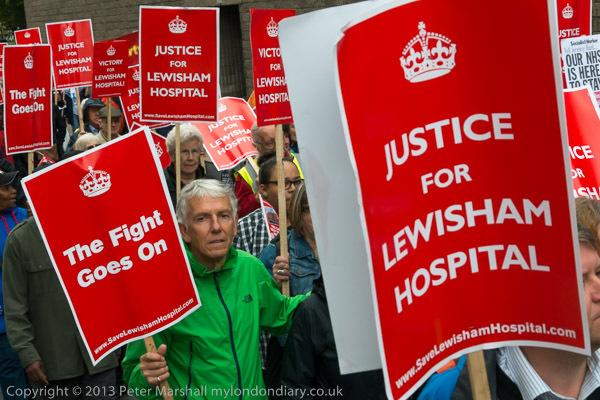 It really was a shame, because the Lewisham campaign – which brought a huge crowd out onto the street on another rather cold and damp day last November – see Save A&E at Lewisham -Hospital and had us all wading in the mud at Mountsfield Park in January – Save Lewisham Hospital may not always have had the weather on its side but has been very successful. 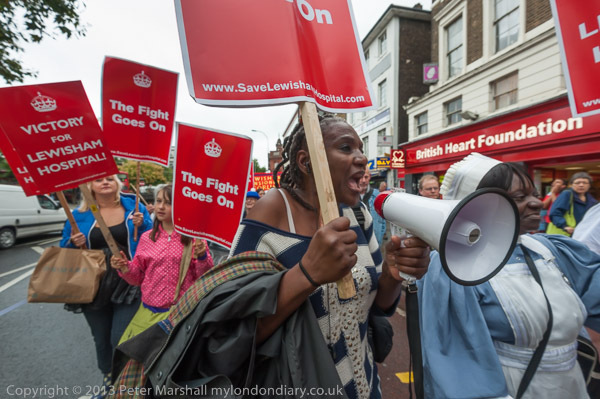 Although the minister decided to appeal when he lost the case in court (and will probably decide if he loses to pass legislation to change the rules) the strength of the local opposition has meant significant gains for the local community – and will mean fewer unnecessary deaths in the area. I was standing on the low wall around a roadside flowerbed, and the bright green coat being worn by one man really stood out in the sea of people in largely rather drab rain wear and carrying uniformly red placards. This was the first of four frames – with the 218-105mm at 50mm (75mm equiv) and clearly the best, partly because he is looking at me, but also because it is the one with the clearest link between the two placards in the foreground, and also because of the fairly precise framing of the placards at the top left. As usual this image is full frame. 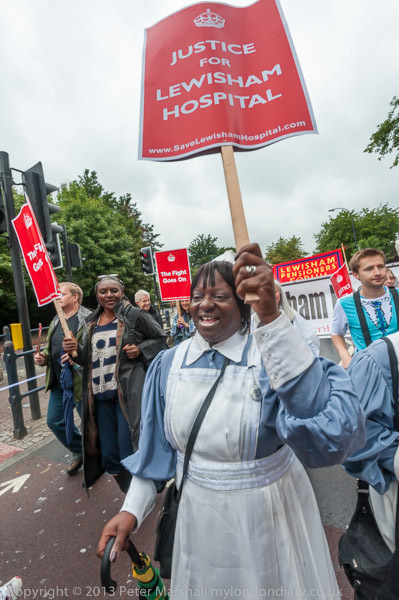 More pictures: Lewisham Hospital Victory Parade. Pictures with flags blowing in the wind are always something of a challenge, and it took a little patience and luck to get this Bahraini flag blowing how I wanted it. 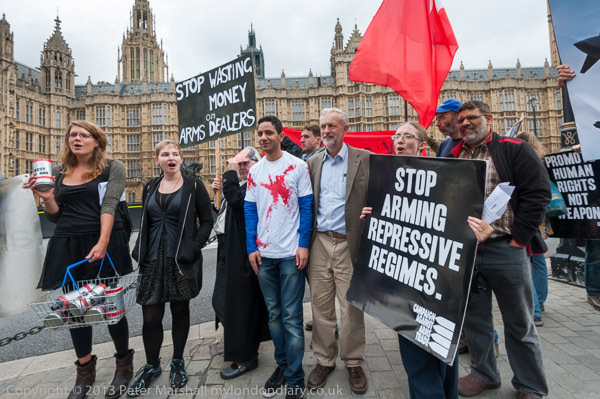 The picture was made during a photo-op at the Houses of Parliament organised by the Campaign Against Arms Trade (CAAT) as a part of its week of actions against the DSEI arms fair that was taking place in East London. I don’t much like such ‘photo-opportunites’ as they usually end up with a large group of photographers, often with some kneeling and others standing behind them taking a rather boring group photograph. Most of the pictures of course look rather similar, and it’s depressing that newspapers seem to like these predictable images. So I take at least one of them, but try to provide something more interesting, though too often it will be the posed one that sells. But I’d gone to this one partly because I think about the last thing we want in London is an arms fair, but also because I expected CAAT to provide a more varied event than most to be photographed, and I was right. Someone did suggest that I was either holding the flag or got someone else to hold it, but that wasn’t the case, though I have to admit I have occasionally done so in the past. But this was the second of five frames I made, and they show convincingly that it was blowing free. I was using the Bahraini flag for several reasons. 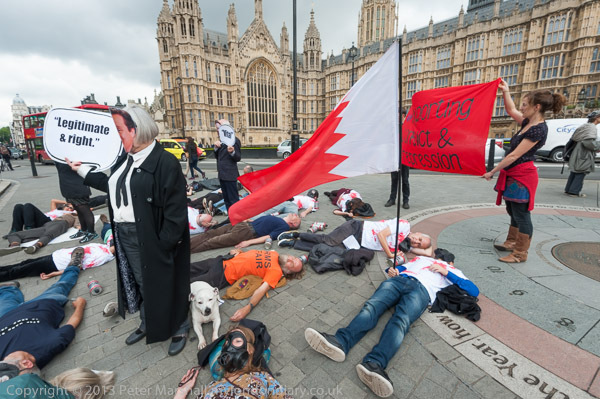 First for the same reason that it and the Bahraini protester on the ground at my feet and just out of the picture had brought it – that arms from deals made at earlier DSEi arms fairs sold to Saudi Arabia and Bahrain had been used against peaceful protesters in Bahrain. But it was also for its graphic effect, and not least in an attempt to simplify the rather messy scene in front of me – which you can see in another image taken just a few seconds later. Both images were with the 16-35mm on the D700 at 16mm, and at ISO 400 and exposures around 1/320 f8. The red banner with the message ‘exporting conflict and repression’ is more or less at the centre or the top picture (though you can’t read the ‘UK’ at the start), with the red continuing into the jumper around the waist of the woman holding it and to the fake bloodstains in the ‘victim’ on the ground and also on the stripes on the ‘tear gas’ canisters. 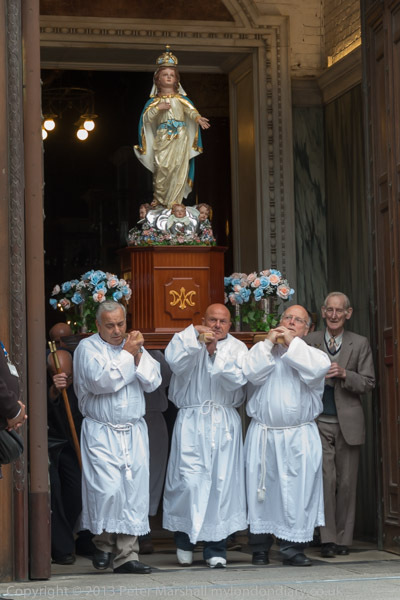 I think it’s an image that would benefit from just a slight crop at right – not every image quite fits the 3:2 format, and I find the figure on the extreme right in a white shirt pulls my eye away a little. I suppose too that I would have rather have had a slightly more recognisable view of the Houses of Parliament as the backdrop, but you can’t see Big Ben from this part of Old Palace Yard. Of course I took more pictures, and after the ‘photo-op’ there was also something more of a protest and a short rally, with Jeremy Corbyn coming out to talk to the protesters., and pose with them for a few pictures. 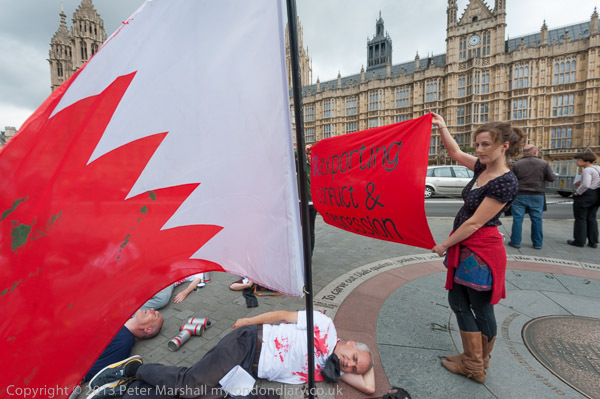 You can see more pictures at Arms Trade Die-In at Parliament. 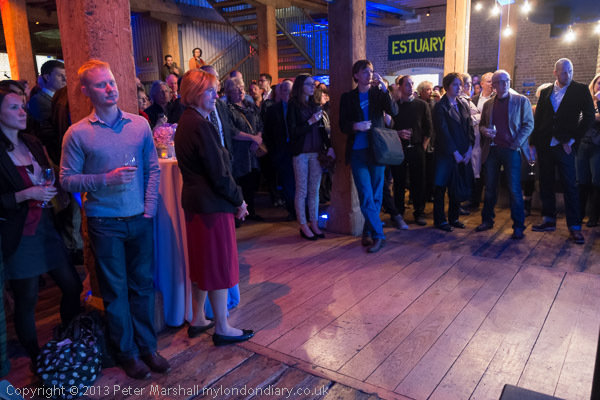 It seems a very long time since I was enjoying oysters and other seafood at the opening of Estuary in mid-May at the Museum of London in Docklands, and like all good things it has to come to an end – and that end is on 27 October 2013 – this Sunday. So this weekend is your last chance to see the show as a whole, although my images are also mostly on line on various sites – including a few here in the post Not A Drop in Bermondsey, and others in my book ‘Thamesgate Panoramas‘ or on the Urban Landscape web site, as well as in the on-line Museum of London Collection. But there are other artists in the show, and some of their work is rather harder to find anywhere, and there is also something about having different views together in the same space. The show is the largest contemporary art show the museum has attempted so far with work by Nikolaj Bendix Skyum Larsen, Christiane Baumgartner, John Smith, Andrew Kötting, William Raban, Simon Robert, Michael Andrews, Gayle Chong Kwan, Jock McFadyen, Peter Marshall and Stephen Turner, and Time Out’s Critics’ choice described it as ‘Unexpected and thoughtful insights into this often overlooked but mesmerising environment.’ But it’s a little disappointing that I’ve not seen any serious critical review of the show. There is a short video made by the museum on putting on the show which is interesting, and also a video featuring the work of two of the artists. Currently I’m beginning to think about another show next year at a central London venue where I will be showing work with artist Hilary Rosen. The central theme of the show is likely to be the River Thames, but I think most of the work will be different to that in ‘Estuary’. 9/11 is one of those events that everyone is supposed to be able to remember what they were doing when it happened. For what it’s worth I was unlocking my bike and preparing to cycle home after a teaching session when a colleague who had lived in New York rushed up to me in some distress and told me what she had just seen on her computer, and I cycled home and switched mine on to find out more about what she had been telling me. It really didn’t look real, though it clearly was (and no, I don’t believe the conspiracy theorists.) Soon I was searching the web for photographs and writing about the photographic coverage of the event, publishing a piece that I think got a normal month’s hits – around a million – in a day. It wasn’t just the start of the a new era of terrorist threats – and of a US ‘War Against Terror’ with disastrous consequences for Iraq, Afghanistan and elsewhere – but also marked a watershed for photography, or at least news photography. For although there were plenty of pictures by professionals – at times I think almost every other person in New York is a photographer – but the images that truly brought home the horror and the drama of the situation were those taken by people on their phones on their way down the stairs of the towers, or running through the lobbies. There were pictures too of generally tiny dots in mid-air, those who chose to jump to their death rather than wait to be burnt, though I’m not sure I linked to any of those. September 11, 2001 was perhaps the start of ‘citizen journalism’, or at least the first truly major event which it recorded. Terrible though the events of September 11, 2001 were, in some ways those of 11 September 1973 were worse. The CIA backed coup in Chile brought into power a brutal regime under Pinochet, and although deaths in the actual coup were relatively low, thousands were killed in the in the first months of the military government, and the disappearances and deaths continued, with final estimates of the dead varying between 4,000 and 30,000. 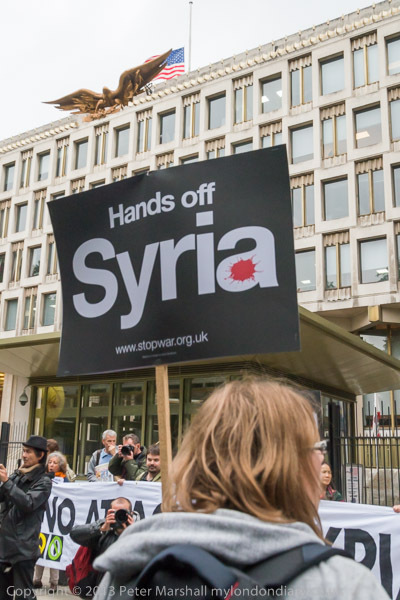 Both events were mentioned in the speeches at the Stop the War protest outside the US Embassy on the day of the anniversary, but the protest was about stopping the US from engaging in military involvement over Syria. 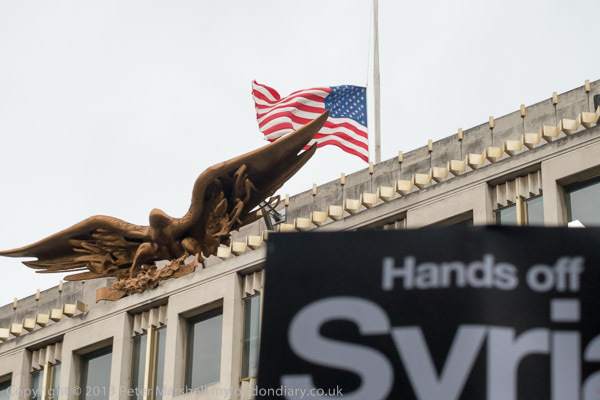 It was a relatively small protest, in part because of the poor weather, but also because events had moved and Obama had already drawn back from the threat of imminent attack. Had it not been 9/11 I suspect Stop the War might have cancelled the protest, but I think the anniversary seemed too good an opportunity to miss. My main problems were the weather and the light. 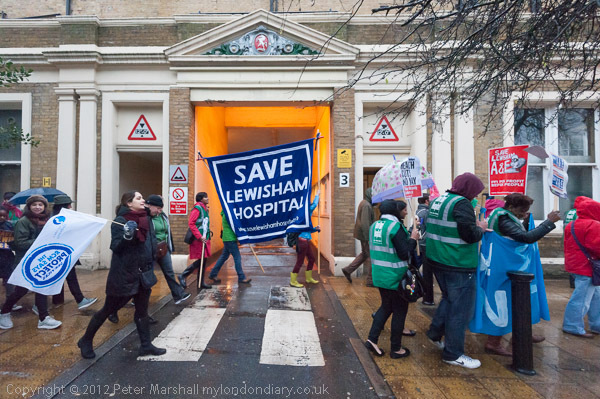 It had got pretty dark by the time I arrived, feeling as if it was around a couple of hour later in the day with heavy cloud cover, and soon afterwards as the protest began, so did the rain. Fortunately I’d taken some pictures of the US flag at half mast, as it soon looked rather bedraggled, which might be appropriate but doesn’t make for good pictures. Soon I was taking pictures of people holding umbrellas, and having even more problems with the light. Black umbrellas create some pretty dim areas underneath them and there are problems too with coloured umbrellas. There really was some very red light on the heads of these two women, and it gives them a rather odd appearance. I’ve actually cut it down a bit in this image, by adding a little of a complimentary hue locally in Lightroom, and I could have done more, but decided to keep most of the effect. Possibly the umbrellas help in some of the pictures, and visually there was perhaps little of interest otherwise, but the rain isn’t good for taking pictures. Although as usual I kept wiping the drops from the lens filters, as usual some images were spoilt as new drops arrived between wipe and exposure. 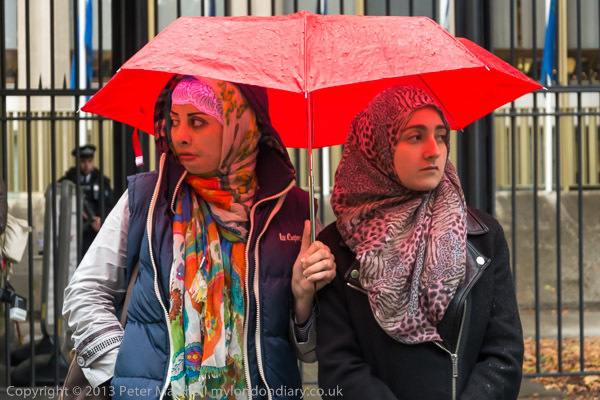 I always carry a small folding umbrella in my camera bag, but seldom use it while I’m actually taking pictures. It’s hard to find the extra hand you need to hold it when you are taking pictures, and when you are working in a crowd – even a fairly loose one like at this protest – it just gets in the way when you try to move around, catching with other umbrellas. Even if I’d had an assistant to hold one, it would still have been a restriction. So I got wet, though not quite as we as the people holding the banner. I’m not sure if the placard at the right has collapsed when wet or had been bent down to help shield the holder from the rain. Whichever way it had outlived its usefulness as a placard. At least the organisers had a good reason to cut down on the speeches, which I wasn’t finding too illuminating, and we left the protest considerably earlier than I’d expected. I wasn’t sorry to get out of the rain and be on my way home. 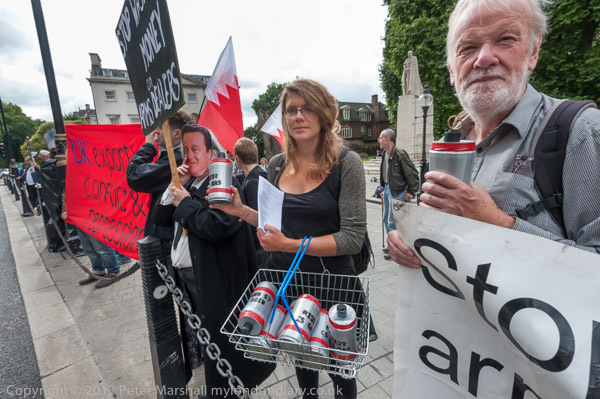 More pictures at 9/11 Protest at US Embassy. I’ve just realised that I’ve just passed a possibly significant milestone. Two thousand posts is quite a few for a blog, and according to my WordPress ‘Dashboard’, this post will be my 2003rd to be published. Back in the old days, WordPress used a simpler consecutive numbering system and it was easier to tell, with my first post being http://re-photo.co.uk/?p=1 and the second published being http://re-photo.co.uk/?p=3 – telling me that something happened to p=2. 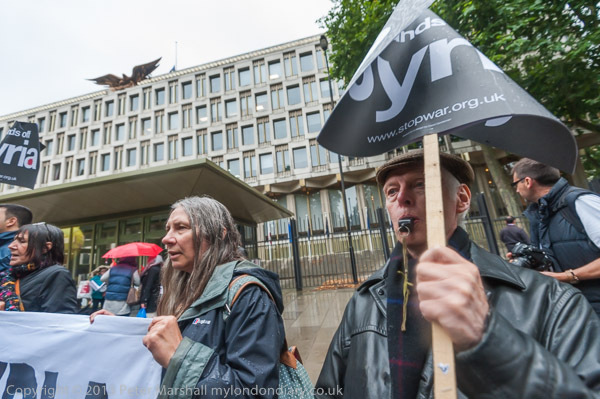 Now there seems to be a random skip of a few numbers with each post, and what I think was my 200oth post, Occupy at DSEi, was http://re-photo.co.uk/?p=3071. Paris was full of photographs in November, and there were some great ones at Paris Photo. But there were things that were hard to take too. Large empty wastes of dollar-rich nothingness covering the walls of some galleries. Vintage prints pulled from some photographers waste-bins and awarded stupendous price-tags. I found it hard not to burst out laughing when a dealer came up to the person next to me and told her the price of one rather ordinary ’60s fashion print was 20,000 euros. A couple of years ago we would have though 200 rather steep, and 2000 definitely well over the top. Still, all good news for investors, and for the minority of photographers who have a place on the gravy train. There were a few other photographers around, trying to talk to dealers, but this wasn’t the place for it. “Best if you e-mail us” they were politely brushed off. The first day I had a panic attack of sorts as the place got more and more full of people, all there for the free opening party, and had to rush out and up from the bunker into the fresh air above. The next day things were better, less crowded, but still more a place for millionaires than photographers. But fortunately, there was much more in Paris than Paris Photo. Looking through the first few posts brought a few smiles to me, and there are certainly many things in those early posts that still come back into these pages now. But it’s also interesting to me to see what has changed, and in part because I’m actually doing much more photography now – back then a large part of my income came from writing about photography – mainly about other people’s photography. I’ve just spent half an hour or so reading some of those early posts, and most of them are still of some interest. Even my post about Lightroom 1.0 and 1.1 still has some point, though rather less than Photographing with a Bicycle. There’s a nice series of five posts on the significant aspects and photographers omitted from what was intended to be a major overview of British photography, starting with A Whole Empire, and going on to write brief posts about the work of four major figures unaccountably omitted. It’s a series I could and perhaps should have continued to point out the equally biased coverage of the subject after the First World War too. It’s actually been hard to stop reading and to get this post written, before I have to dash out to take more photographs. You are currently browsing the Re-photo blog archives for October, 2013.